Astoria, Queens, New York, U.S.
Ronald Walken (born March 31, 1943), known as Christopher Walken, is an American movie, television, and theatre actor. He is best known for playing evil or mentally damaged characters. He has sometimes used that image for comedic effect. Walken is a skilled dancer who in many of his movies dances, because he requests it. He has has appeared in more than 100 films and television shows. Walken's films have grossed more than $1 billion in the United States. Walken debuted as a film director and scriptwriter with the short film Popcorn Shrimp in 2001. He also wrote and acted the main role in a play about his idol Elvis Presley, titled Him, in 1995. Walken has been guest host on Saturday Night Live many times. He has played many well known characters on that show. He was born in Queens, New York to a German father and Scottish-born mother. Walken has been married to casting director Georgianne Walken since 1969. Influenced by their mother's own dreams of stardom, he and his brothers, Kenneth and Glenn, were child actors on television in the 1950s. At age 15, when a girlfriend showed him a magazine photo of Elvis, Walken said, "This guy looked like a Greek god. Then I saw him on television. I loved everything about him." He changed his hairstyle to imitate Elvis and hasn't changed it since. As a teenager, he worked as a lion tamer in a circus. Walken went to Hofstra University, but dropped out after one year, having gotten the role of Clayton Dutch Miller in an Off-Broadway revival of Best Foot Forward, co-starring with Liza Minnelli, who played Ethel Hofflinger. Walken initially trained as a dancer in music theatre at the Washington Dance Studio before moving on to dramatic roles in theatre and then film. 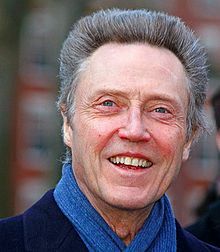 Described as "diverse and eccentric" and "one of the most respected actors of his generation", Walken has long established a cult following among film fans. He's known for his versatility and named as one of Empire magazine's "Top 100 Movie Stars of All Time". Following his early (1950s) work in television and theater, Walken has acted primarily in films. Christopher Walken Facts for Kids. Kiddle Encyclopedia.